The Department of Trade and Industry (DTI) may be heading for a revamp, the UK's trade secretary has hinted. 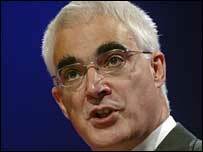 Alistair Darling also told the British Chambers of Commerce (BCC) that some MPs had suggested the DTI be scrapped. But, at the BCC annual meeting, he did add that much of the DTI's funding would need to continue in many areas, such as nuclear decommissioning. Mr Darling's comments came as a BBC survey of 145 firms found that only 8% saw the DTI playing an important role. Meanwhile, a further BCC poll said UK businesses found it harder to start and grow a business now than in 1997. "The question is, could the DTI be improved, should changes be made? The answer is yes," Mr Darling said. Both Liberal Democrat Treasury spokesman Dr Vince Cable and shadow foreign secretary William Hague told the conference they were "sceptical" about what the DTI does. However, BCC chief David Frost did admit that without a strong DTI, the views of the private sector may "become an afterthought in government". But Mr Frost did also warn that the government must act to ensure young people leave school with a good enough education to get a job, as half of Britain's youngsters are leaving school without five decent GCSEs. "It is nothing short of a national disgrace. This is in the 21st century, not Victorian Britain," he told the London conference. Mr Frost also called for "enterprise zones" to be introduced around the UK in an effort to encourage new businesses. Among the "radical" measures Mr Frost suggested to promote new businesses were setting up areas where companies were exempt - for a short time - from rates and employment laws. The call came as the BCC revealed that business leaders blamed a lack of education and skills, as well as an increase in red tape for companies finding it more difficult to launch new businesses. According to the BCC, 69% of the 145 businesses surveyed said it was harder to set up and develop a business now than 10 years ago when Labour came to power. The findings were in stark contrast to a government study which found that UK companies were dominating a European champions league of business. Of 750 top European firms, UK-based businesses were responsible for more than a third of Europe's total profits, the report found.